Pi is the ratio of a circle’s circumference to its diameter… and so much more. Pi In The Sky played upon the American colloquialism pie in the sky, a catchphrase for impossible thinking. 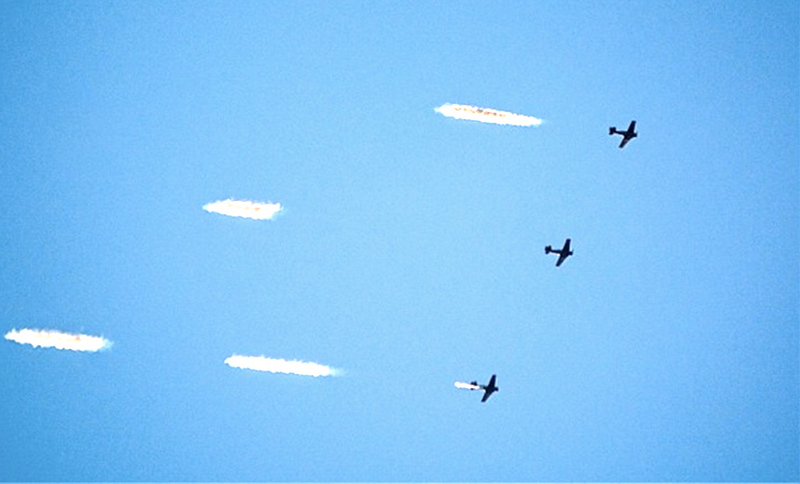 Pi In The Sky represented the nexus of science, technology, engineering, art, and math. The skywriting installation in partnership with AirSign USA created the first 314 characters of Pi’s infinite and non-repeating sequence in a 100+ mile arc over entire regions. Each number was roughly a quarter-mile wide and was imaged by a team of five synchronized airplanes flying at 10,000 feet elevation. The radically accessible ephemeral installation lasted approximately an hour-and-a-half and represented the largest ephemeral art installation in history. Pi In The Sky played upon the 20th-century American colloquialism pie in the sky, a catchphrase for impossible thinking. Ideas labeled as such are deemed worthless, unachievable. By skywriting an oversized chunk of Pi’s numeric sequence high over our heads, ITA proved that impossible ideas not only can happen, they do. However, the textured meanings of the artwork run much deeper. Pi is a mathematical constant. Some say it represents a universal truth, a common understanding that rises above language, borders, affiliations and beliefs. By flying Pi overhead and encouraging a simultaneous lifting of our collective gaze, the artwork established a momentary shared focal point, a prevailing and unfurling truth upon which we all can unite. Yet Pi is vexing. The attributes that define Pi are drenched in poetic ambiguity. Pi is both an irrational and a transcendental number. It is a mathematical constant, unknowable and unseeable due to it’s infinite and random nature. Pi In The Sky was first flown over the entire San Francisco Bay Area as an official artwork of the 2012 ZERO1 International Art & Technology Biennial. The second version was flown over Austin, Texas as part of the 2013 SXSW conference. The third iteration was on July 12, 2014 over New York City reaching millions of people. During its initial first installation, social media posts from teachers around the San Francisco Bay Area came crashing in. Students captivated by the installation during recess remained engaged back in the classroom. One teacher reported students writing the numbers of Pi on their arms. Enterprising teachers reworked the day’s curriculum to include Pi, providing a national model for curriculum possible across K-12 and higher educational environments. Check out the #piinthesky crowdsourced response on twitter. Illuminate the Arts would like to thank the following for their generous cultural and technical contributions to Pi In The Sky.